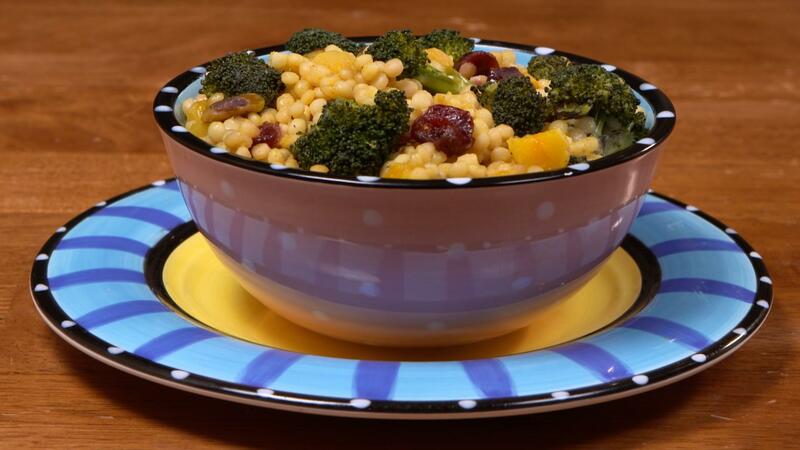 Draw Raves with this Luscious Curried Couscous Stir Fry with dried cranberries and apricots! In a small saucepan over medium-high heat, bring broth to a boil and add couscous. Reduce heat, simmer 10 minutes. Set aside.Heat olive oil and crushed chili over medium high heat in a 10” wok or frying pan. Add garlic and scallions, saute` 2 minutes and add florets. Reduce heat to medium low, cook just until broccoli is crisp tender and add apricots and cranberries. Simmer a few minutes to plump fruit and add cooked couscous, turmeric and Ponzu. Mix thoroughly and keep warm until ready to serve.